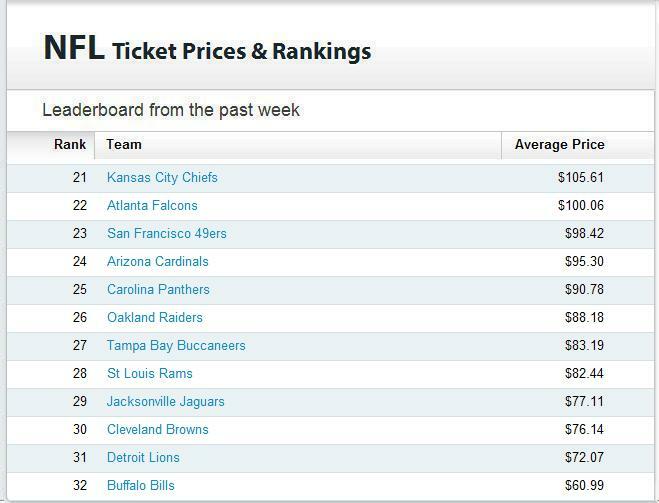 Week 6 is highlighted with some interesting developments in the Ticket Price Leaderboard in what seems to have been the most volatile week yet. 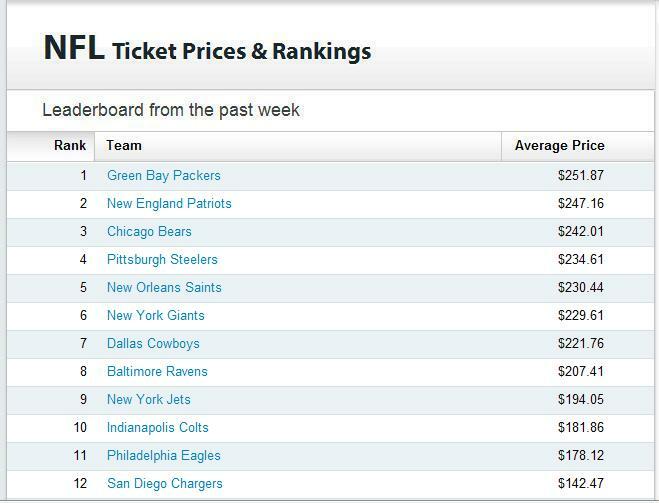 The Packers jump up from 5th to 1st, with their price jumping up a good $35. The Packers are hosting the Dolphins this Sunday, but there might be some early buyers for the following weeks game, which will be a Sunday Night Game, against a divisional rival, that happens to have a certain once-beloved Quarterback and a new receiver. The Dallas Cowboys dropped out of the top-5 for the first time all year. Their overall price rose, but with the next home game being the Giants, it would have been normal for the price to rise much further than it did. The only newcomer in the top-12 are the San Diego Chargers, fresh off a loss that gave them their fourth strait 2-3 start to a season. Either their fans realize that the Chargers usually go on a run around this time of year, or are paying top dollar to see the Patriots come to town in two weeks. Although it is obvious that there is quite a gap between spots 11 and 12. And now to the bottom-12. Talk about perception being reality! The Cardinals one a game by lucking into many fluky plays, while the Chiefs lost in a good showing in Indianapolis. The fans of each team, I guess, saw the real showing behind the result, as the Chiefs prices rose $13, while Arizona saw their prices fall $20 (although that could partially be explained by the fact that the Saints game skewed the earlier prices). Just to pat myself on the back again, the Chiefs prices continue to rise, as I predicted in my post detailing the Chiefs prices two weeks ago. The Chiefs prices are now over the century-mark again. The Bills prices continue to plummet, as they are selling barely over $60. Their prices may be more sad than the teams’ performance. For a team that is one of the premier candidates for a possible relocation, this is not a good sign. The top-12 had a lot of transition. The Packers, despite a bevy of injuries, including a concussion to Aaron Rodgers that might put him in jeopardy for this Sunday’s game, rise. The Buccaneers, despite winning a close game on the road against a playoff team from a year ago, fall. Like everything else in the National Football League, parity reigns. Comments? Questions? Feel free to drop a comment, or tweet a tweet (@SeatGeek). ‘Till Next Time.